This semester, you will study more than 400 years of history, learning about a country that covers nearly 3.8 million square miles. "Themes in American History" is a big course. It’s a story about wars, epidemics, crises of faith, natural disasters, enduring love, immense power and unimaginable pain, and the things people live and die for. Above all, it’s a story about the lives of ordinary human beings. By reading about the lives of specific people (our "biographical approach"), you will also learn about the countless people who lived around them. And by studying how great events have affected individuals in the past, you will find new ways to understand life today. In practical terms, that means this course has three main purposes, which are addressed by the three main components of the coursework. I. Lectures: In a single semester, you will see an overview of the entire history of the United States. That will help you fit together the smaller details of history. And it will help you see the context for the things you study in every other class. II. Discussions: You will develop skills for thinking analytically and critically about human society. As you will see, similar problems, needs, and desires have appeared in different times and places. By reflecting on what has happened in the past, you will prepare yourself to face the future. III. Assignments and Exams: You will improve your reading and writing skills. People make sense of human life by putting experiences into words. This course will give you practice. The skills you develop will help you professionally and will give you a better basis for participating in American civic life. We will meet in class three times a week. On Mondays and Wednesdays, I will generally lecture. On Fridays, you will come to class prepared to discuss the week’s assigned readings (about 30 to 50 pages per week). I may vary this schedule as necessary to accommodate exams and holidays. Homework related to the readings will be due in class on Fridays. You will also take two exams and turn in two "visual history essays." The first essay will be a paper of two to three pages. The second essay will be a paper of three to five pages. I will provide further information about these assignments later in the semester. You must purchase the following books and be prepared to use them by the start of the second week. I expect you to bring your books to class when we discuss them on Fridays. I will also sometimes assign supplemental readings, which I will provide. 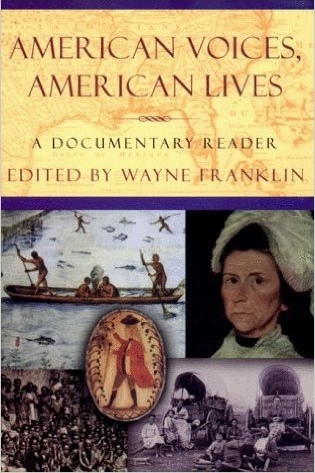 I. Wayne Franklin, ed., American Voices, American Lives: A Documentary Reader (W. W. Norton, 1997). ISBN 0393970949. II. 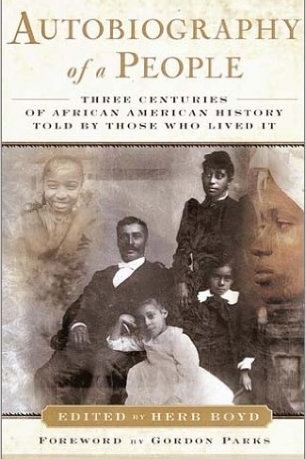 Herb Boyd, ed., Autobiography of a People: Three Centuries of African American History Told by Those Who Lived It (Anchor Books, 2001). ISBN 0385492790. You must also arrange to purchase one graphic memoir (personal narrative in comic-book form) from the following list. These books are not available in the university bookstore, so you will have to find your choice in another bookstore or from an online bookseller. You will read this book and discuss it in your second visual history essay. Art Spiegelman, The Complete Maus: A Survivor’s Tale (Pantheon, 1996). ISBN 9780679406419. Based on Spiegelman’s conversations with his father, a Holocaust survivor who moved from Poland to New York. Note: Contains shocking scenes and stories. 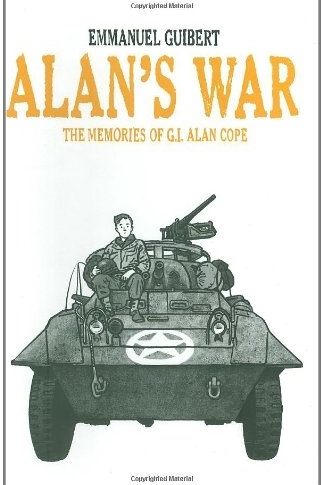 Emmanuel Guibert, Alan’s War: The Memories of G.I. Alan Cope (First Second, 2008). ISBN 9781596430969. Based on Guibert’s interviews with an American soldier who settled in France after World War II. G. B. Tran, Vietnamerica: A Family’s Journey (Villard, 2011). ISBN 9780345508720. Tells how Tran’s family survived the Vietnam War and emigrated to the United States, and what their lives were like afterward. No general “survey” textbook is required for this course. If you wish to purchase one for your own convenience when studying, I will be happy to recommend one. Discussion: Your participation grade will also be based on how much you take part in class discussions. Even with perfect attendance, you cannot earn an A or B for participation without regularly communicating your thoughts. I understand, however, that shyness or other problems may affect your ability to participate. If you find it too uncomfortable to speak in class, you should find another way to discuss the course materials with me. (For example, you can visit during my office hours or ask questions about the readings by email.) Please remember that I expect all participation to be respectful and constructive. Homework: Homework will normally be due at the beginning of class on Fridays, and it must be presented in hard copy. (Handwritten homework is acceptable if it is neat and legible.) If you are absent on a Friday, it’s your responsibility to hand in the homework early or have someone else turn it in for you. In general, homework assignments will consist of questions asking you to reflect on the weekly readings and discuss them in writing. These assignments will be posted on Blackboard. For most students, the reading and homework combined should take three to six hours per week to complete. Late Work: All late assignments, including homework assignments, will be penalized one letter grade (ten percentage points) per calendar day. To turn in a late assignment, you must email it to me (to prove it is finished and stop the penalty clock) and turn in a hard copy at the next class meeting. Missed exams may not be made up except in extraordinary and documented emergencies. Privacy: To protect your privacy, I never discuss grades by email, and I will not discuss your educational records with anyone else except La Salle University officials who need to know about your progress. Email: You should check your lasalle.edu email account often. It’s the main way I will communicate with you outside of class. I expect all of your email communication to be courteous and properly written. Begin with a salutation (“Dear Prof. Wilson” or “Hi, Prof. Wilson” are fine) and end with a signature. Writing professional email messages is an important part of preparing for almost any career. Emergencies: If for some reason I must cancel class suddenly, I will try to send a text message through the ExplorerAlert system, so you should register for emergency notifications at www.lasalle.edu/alerts. Academic Honesty: Learning requires work. Shortcuts on assignments are short circuits in your education. They are unfair to other students, and they also waste your time and money. So never cheat on an exam, never present someone else’s work as your own, and never make up an illness or emergency. If you have any questions about academic honesty, speak with me immediately—before the assignment is due. After you turn in a paper or exam, it will be too late. Plagiarism or another form of cheating will result in an automatic failing grade (0%) on the assignment and may result in a formal referral to the dean’s office. A second offense will result in an automatic failing grade for the course. Plagiarism: As a college student, you have a responsibility to learn the ethical standards of American universities. For a basic guide to writing plagiarism-free papers, please visit http://www.lasalle.edu/library/plagiarismandcopyright. The Sheekey Writing Center (and I) can provide further guidance.